Pigs aren't always the first animal people think of when they consider backyard livestock, but raising backyard pigs can be an easy way to create an inexpensive source of pork and bacon. Furthermore, raising pigs can be an educational experience for the whole family, and backyard farmers often find raising their own meat very rewarding and tastier than supermarket meats. Before bringing a piglet home, first check local laws and zoning restrictions to be sure if pigs are legally allowed in your neighborhood. If necessary, investigate any legal concerns about a new shed or other structure you may build, as well as fencing for your pigs' safety. Be Sociable: Pigs are social creatures and need companionship. 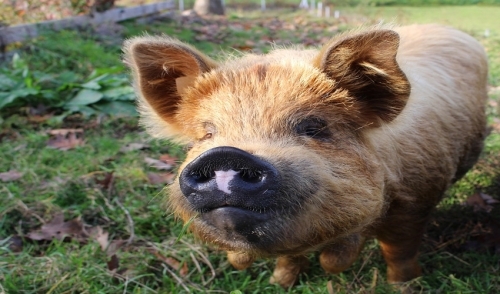 While they can be content with other backyard livestock if you already have chickens, ducks, or a goat, it is best to get two or more pigs so they will be more mentally and emotionally secure in their new surroundings. Fence Properly: Pigs can be escape artists, from tiny piglets that wriggle under fences to larger hogs and sows that can push down a weak, inappropriate fence. You can opt for hog panel fences, wire fences, field fences, or even electric fences, but be sure the fence is sturdy and encloses a large enough area for the pigs to roam. Set Up Suitable Shelter: Pigs don't need a lot of shelter, but a shady place on hot days and a dry spot during rain will both be welcome. With smaller pig breeds, a large dog house or similar shelter can be ideal, or you may opt for a three-sided shed or A-frame shelter to keep your pigs comfortable. Provide Fine Dining: Pigs need plenty of food and can be quite content feeding in a rich pasture, but for the best-tasting meat and healthiest animals, offer supplemental pig feed with plenty of protein. Kitchen scraps, windfall apples, or allowing the pigs access to an overgrown vegetable garden are also great ideas to give them plenty of variety in a balanced diet. Make a Swine Spa: Pigs need abundant fresh, clean water for drinking, and a shallow pool or muddy wallow will also be a welcome feature of any hog enclosure. A simple pool or wallow will provide mental stimulation and give pigs another way to keep cool on hot days. Consider Odor Control: It's no secret that pigs don't have the sweetest smell, and cleaning up after your backyard pigs appropriately can minimize odors. Prepare an area to compost pig manure or arrange to sell the manure or donate it to a community garden. Hanging bags of charcoal around the pigpen can also help absorb odors, and uneaten food should be discarded quickly to minimize odors and avoid attracting rodents. Provide Vet Care: When pigs are only kept for a few months before butchering, they rarely develop severe health problems, but a conscientious pig owner will still watch their pigs' health closely and arrange appropriate vet care as needed. Regular worming is recommended, and any strong health decline should be investigated immediately. Pigs can be easy to raise with just a bit of preparation and understanding of their needs, and once you're ready for them, it's time to bring home the bacon.